European football championship, Euro 2008, is happening in Switzerland and Austria right now. Holland has an advantage of playing their first 3 matches in the same city, Bern. Tens of thousands of their supporter came to Bern. 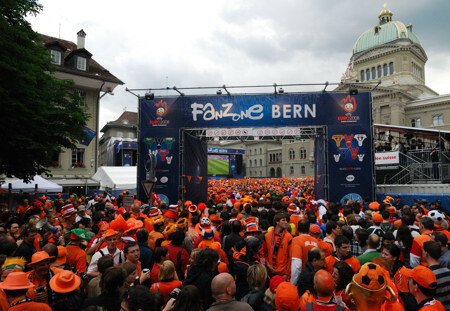 During the Holland match day, Bern turn into orange city. You could find a Holland supporter wearing orange color almost everywhere. Please click the picture below to see other pictures I made. Euro 2008 Fan Zone Bundesplatz, Bern, 13th June 2008.